Following on from our previous post on ideas for making the most out of a shell scheme stand, this post looks at what to do with exhibition stands when you’ve got the whole floor to design with. If you’ve rented space and been allocated a part of the exhibition hall’s floor, you need something to fill that space and make the most impact. The days of standing behind a table and handing out flyers to everyone that passes by is long gone and as we said in the last post, you’ve got seconds to grab a visitor’s attention. Because of this, you need something eye-catching and visual as well as large enough to fill the space you’ve been given. Being eye-catching is common sense – bland or unappealing just won’t inspire in a crowded hall – but large? There’s a lot of competition in that exhibition hall and you’ll be vying for prospective customers’ attention the same as everyone else. If someone is walking two aisles away and catches a glimpse of your display, you need it to pull them in and get them interested. You also need to remember that your stand, like any of your promotional print such as signage, brochures, or business cards, conveys who and what your company stands for. I understand everything has a cost and exhibiting needs to be cost effective but looking impressive in an exhibition hall needn’t be as expensive as one might think especially if you put some ideas into the design and flow of your space. 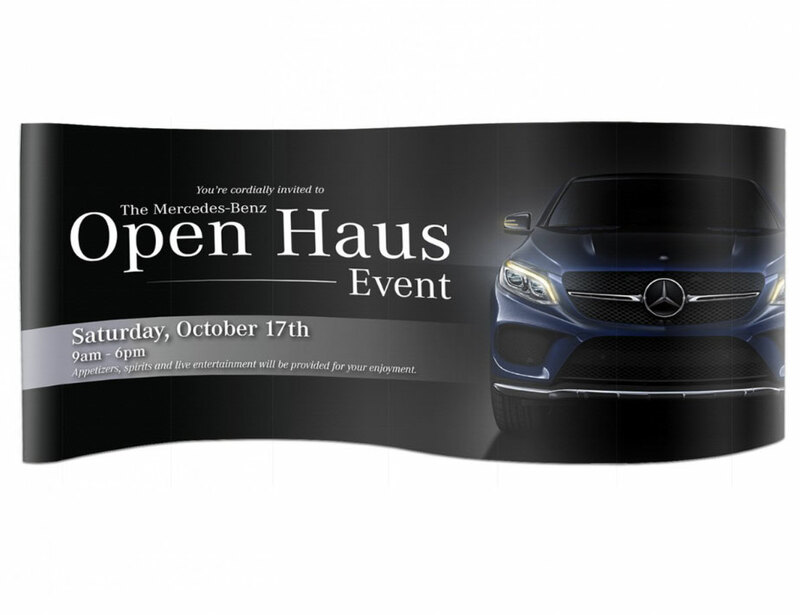 Now, roller banners or a Pop Up Tower could be the first option when looking to fill the floor. 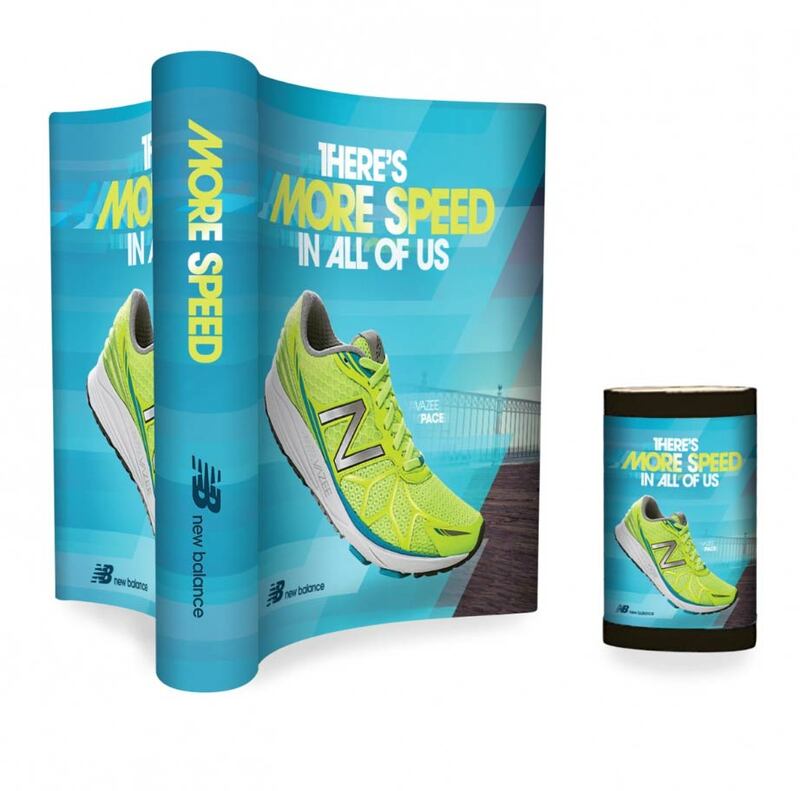 In most spaces though, a roller banner is going to look a little lost unless incorporated within more display units, and that means more cost for what may be minimal extra impact. The first alternative to fill more real estate both in height and area is a Pop Up Stand. How is it being transported to the venue? Who is putting it together? Is it to be reused? How unique do you want your brand to appear? 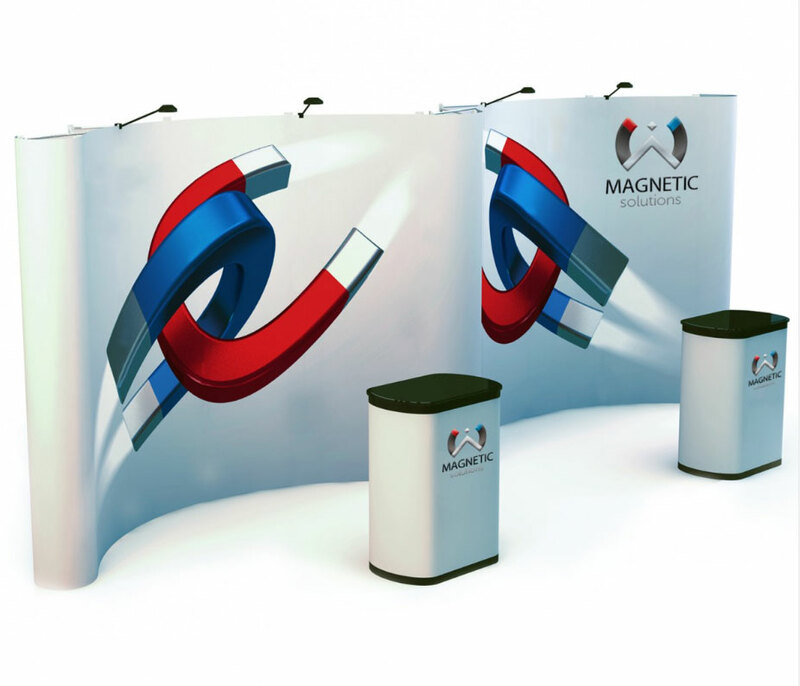 Most pop up stands use an aluminium frame and a number of printed panels that are attached to the frame using magnetic strips. 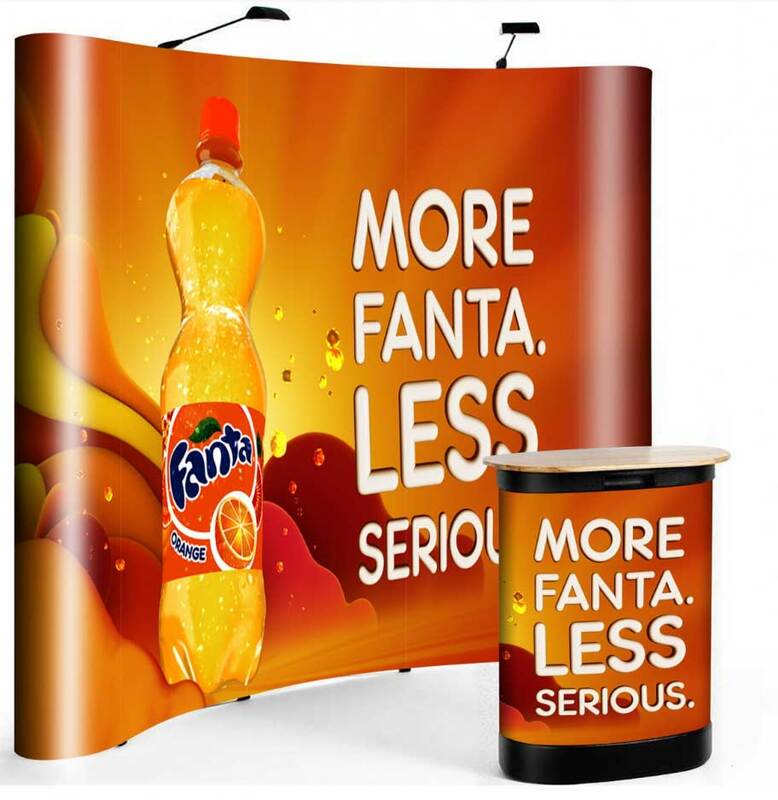 Something like our Express Pop Up stand is ideal for its low cost whilst still offering big impact. It’s 2.2m tall and can be fitted with lights along its straight or curved width options. The printed panels use a tried and tested polyester film and are finished with a scratch resistant surface. 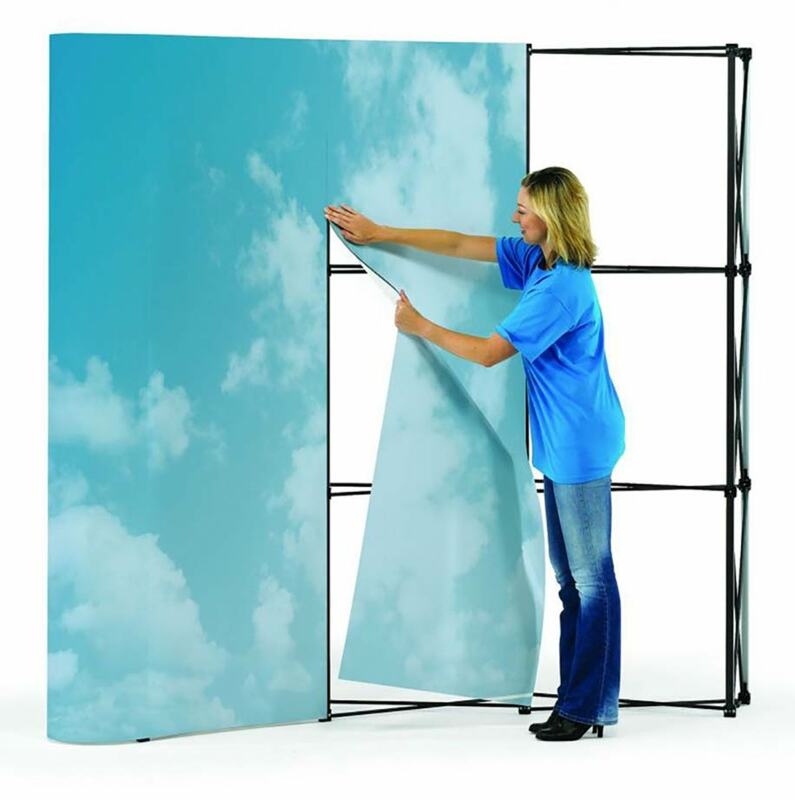 For transport and storage, these panels are placed inside a wheeled case which doubles up as a podium when exhibiting. The aluminium frame also folds down and is popped back in its own case. There is also the popular Expolinc pop up system that offers ease of assembly while offering either a straight or curved display. It’s a simple solution and works well. The only downside is that in an exhibition hall, there will be potentially hundreds of this same type of unit. Not an issue if you’ve got the design in place to look unique, but if your stand needs to really stand out, there are other options. An L Shaped stand will not only fill the space but also transform it with a sense of something much more expansive. Just by having that different free standing floor layout, it catches the eye and has much more of a visual appeal. The ‘L’ can be on either side of the display and with much more wall space, it can incorporate TV screens or leaflet holders. It’ll also give you or your team space to walk around and interact with visitors. We see them not only used in a corner booth space but they also effectively block out other surrounding spaces and help keep the focus on your brand. More information on L-Shaped stands is here. 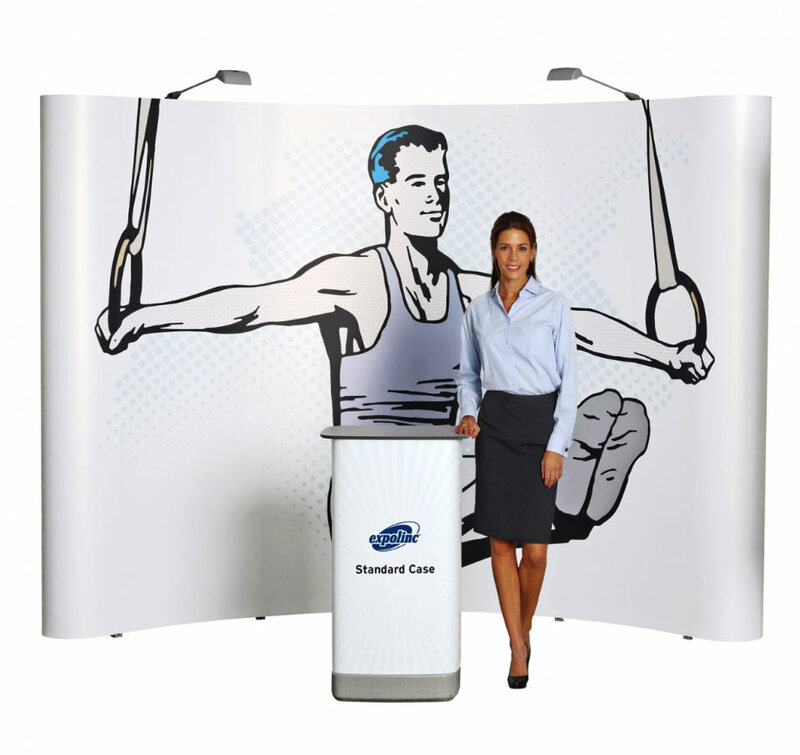 When you’ve got plenty of floor area to cover and you need to look as impressive as possible, the Serpentine or Wave pop up stand is ideal. It’s flowing design makes for a much more attractive unit than a flat panel exhibition display unit. Being just under 6m wide, it also has plenty of space for your brand to tell it’s story. Plus if you have a number of your people on the stand, you’ll need enough room for them to work – the Serpentine has space in spades. The Serpentine and its specifications are here. Another impressive looking option is the ‘W’ shaped Gullwing Pop Up. Like the Serpentine, its spacious width is guaranteed to fill the space effectively and really get your brand seen. 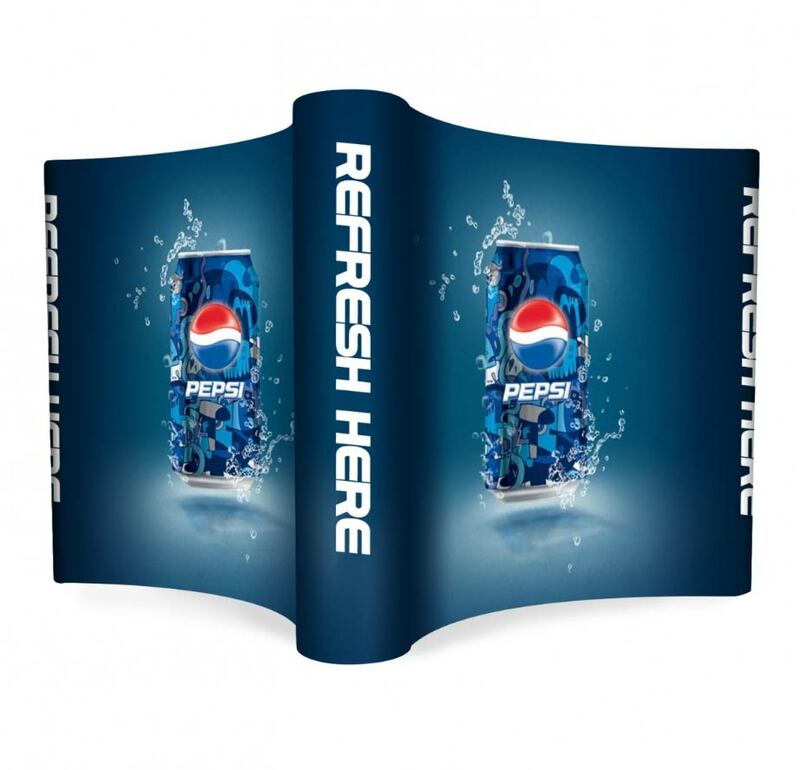 The two sections can either create a flowing seamless display or could even be used as separate areas promoting different facets of your business. The Gullwing’s frame can also be split apart to make up smaller units or even multiple displays for smaller shows and events. Investing in a stand like the Gullwing will give the opportunity to exhibit effectively for many, many shows. 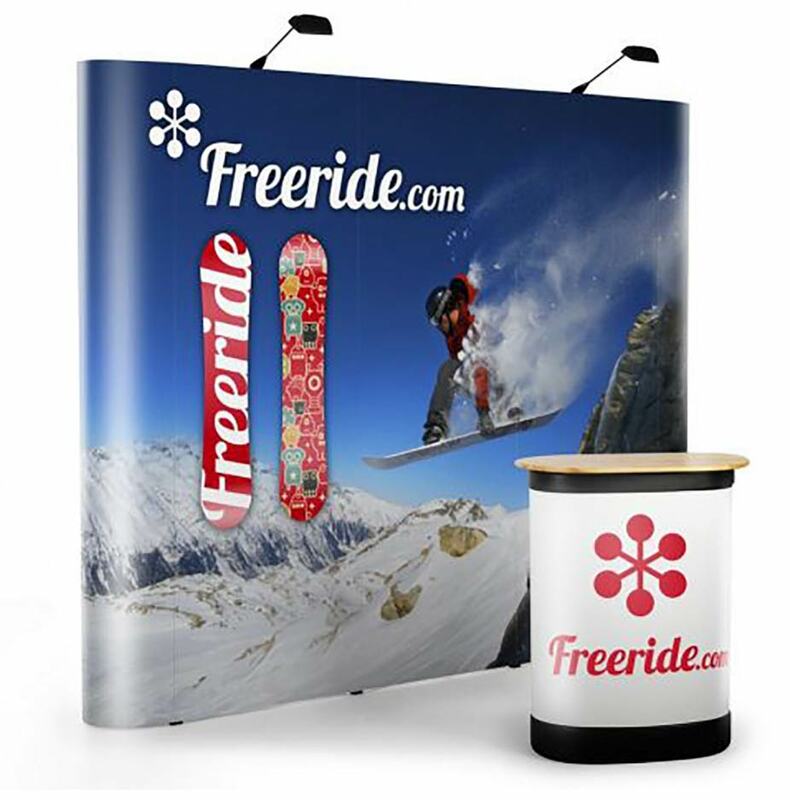 If your floor space allows people to see you from multiple routes within the hall, the simplest and most effective way to showcase your brand to all these visitors is by using a shaped stand. There are options for either triple or quad islands that make your brand viewable from pretty much any angle. They link up regular 3×3 frameworks (making breaking them down as smaller individual stands simple to do) and the panels fit to the frames with the same tried and trusted magnetic bars. If you have a large floor space to cover and are out to impress, one of the Island stands will certainly stop people in their tracks. For details on the Triple Island click here, and the Quad Island is here. Use our exhibition design tips from the post here when thinking about your artwork and be prepared for your next exhibition to be a huge success! This post covers the options for Pop Up Stands that use separate panels to make up the graphics. All these displays utilise the magnetic bars and anti-scratch panels that have been the go-to products for Printdesigns’ Pop Ups for years. However, with textile printing really making advances (plus our investment in the right kit), the alternative fabric display stand may be the better choice for your business. In our next post, we’ll look at the options for making a real impact with fabrics. 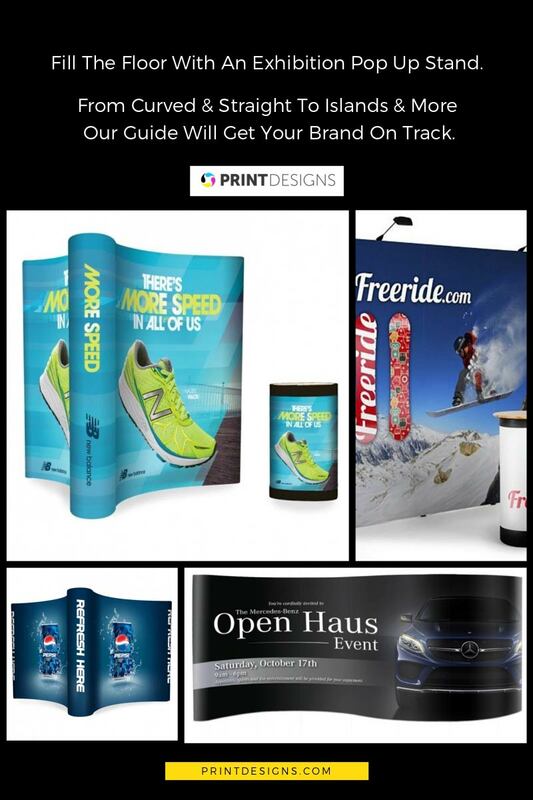 « Everything You Ever Needed To Know About Promotional Flags!